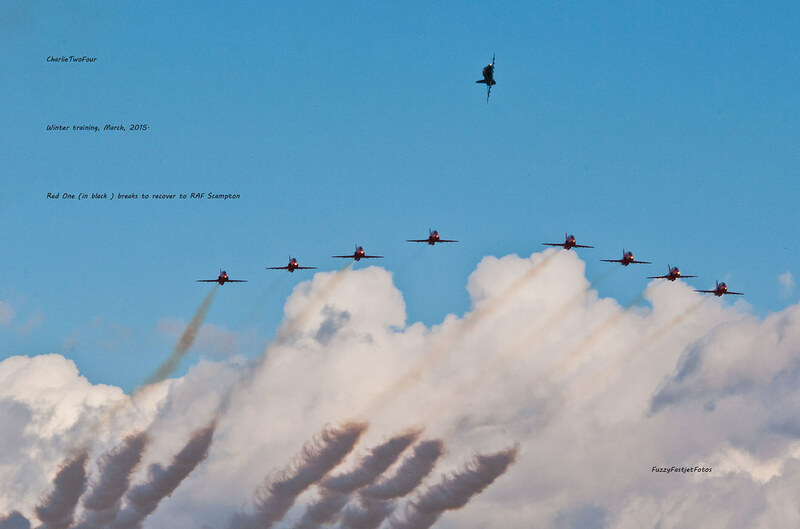 Time to don your warm clothing and head for RAF Scampton. Only a few weeks before the Team depart for the Med. or Greece. Taken after a full nine ship work out, the Boss breaks to land on runway 22R. 493d/48th - Grim Reapers Supporter. There's no "go-round" in a glider. If they haven't changed from the published scheme shown on their w/site & the normal procedures of previous years, the first sortie is around 0830, about 30mins flying and then others go for the second, etc. Generally five sorties a day, each weekday. No guarantee of course. If you are a FaceTwit, you would get better updates than me who relies upon the w/site. It will be slightly awkward for you having to book time off and then the weather closes in. Best of luck, well worth the risk if the weather is good. I've had several years of excellent flying from them at this time of the year. Anyone know when they head off to Greece? In previous years the Red's published in advance the planned daily training schedule (time, duration, number of aircraft), for the next week. I haven't seen these this year. Does anybody know if they are still doing this if so, where I may find it? Try the following, but it shows last practice as on 27/01, but weather may have messed things up since. We don't know why they have only put up times twice and can only speculate. To be fair bad weather means times since then we're always going to be impacted so I would like to see what happens on the next good day. We also published the times for that Wednesday on social media to tie up the callsigns etc but were holding off again to see what they do. Other than their website and ours I am not aware of anywhere else to get times from and across the airfield any mention of times are banned so i am lead to believe. Thanks for that very comprehensive explanation. The decision from the beginning of the 2016 show season presumably covered ISP's during the season and for the first time now covers winter training. PS: Correction on my part. I thought I saw the ISP times last your on your site! But didn't know this was despite ban. Seems closed shop is effective for this winter. If it is any help. In the absence of any published info, my plan for this practice season will be to look for a day with clear weather, drive to airfield. They will be flying between three to five sorties a day to get up to speed. That was the plan when I first made the trips and it worked. A scanner was useful but not necessary. In the spots when the Reds are reviewing there is/are quite often one or two KingAirs from RAF Cranwell making approaches. The HHA aircraft have been known to sneak in too!